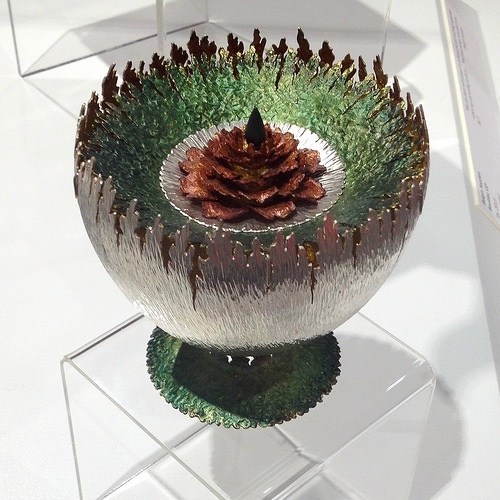 The Alice C. Sabatini Art Gallery hosts a national biennial in the Midwest U.S. of juried high-end craft and 3-D art, showcasing fifty-one pieces selected by juror and metalsmith-extraordinaire Sarah Perkins in metals, jewelry, fibers, clay, wood, glass, sculpture and mixed media. As mentioned in my previous post on artdoesmatter, I’d like to highlight some of these installations more in-depth. I’m very honored to have been selected to exhibit one of my Widget Lockets alongside such diverse wealth of talent and techniques. Gina Westergard: “Flor de Muerto” (installation view). Sterling silver, copper, gold leaf, black onyx, paint, 2011. Photo courtesy of the Sabatini Art Gallery. Gina Westergard, “Flor de Muerto” (interior ring detail). Photo courtesy of the artist. final resting spot for a beloved. In her artist statement, she reflects: “Nestled within the interior of each lid is an element that awaits discovery, representing new growth and renewal. 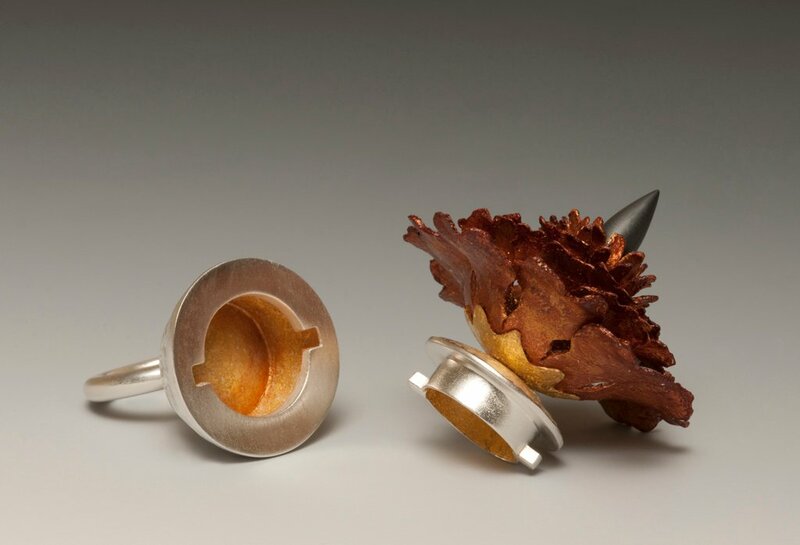 I believe the urn not only holds a life that has passed but also contains an energy that continues.” Westergard is an Associate Professor of Metalsmithing and Jewelry and the Director of Graduate Studies in Art & Design at The University of Kansas. Sunyoung Cheong: “Enchained” (installation view). Cleaning sponges, fabric dye, silicone, 2012. Photo courtesy of the Sabatini Art Gallery. 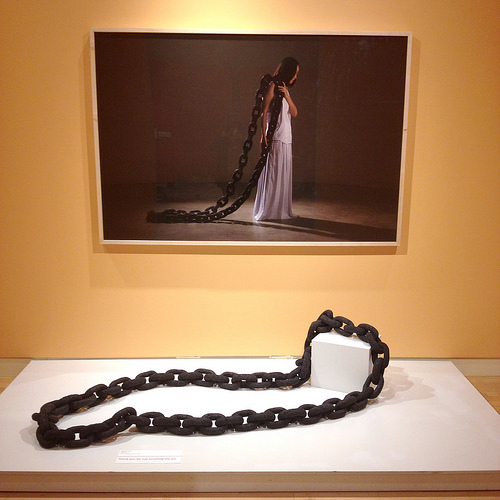 Sunyoung Cheong’s Enchained is an installation that offers a black chain element that is larger in scale to the average human body, positioned in the gallery with a two-dimensional photograph of her jewelry piece hanging just above. The links that comprise the actual piece are dyed cleaning sponges, arranged to be in strict repetition. The title of the work, as well as the accompanying photograph, could imply a negative association that one conjures up while engaging with this piece. Is this a commentary on the artist’s own experiences or otherwise? Here is where attempting a critique rears impossibility – as this work is being viewed through a two-dimensional screen of pixels. However, my frustration with wanting to see this piece in-person is quieted somewhat by the presence of the artist’s framed photograph: is she trying to offer her viewer a parody of domestic women’s work or even the pressures of perceived female societal responsibilities? Or rather, is this just a talented and highly-skilled designer wanting to push the envelope of materials in her jewelry, by “beautifying” a common household item with mysterious black dye? At first glance, before I discovered the exact materials employed, i.e. household sponges, silicone, dye – I had wondered if this work could have been 3-D printed in nylon; the artist teaches digital fabrication techniques currently at The University of Kansas while pursuing an MFA in Metalsmithing. Incidentally, Sunyoung’s Enchained piece was chosen to be exhibited at Confluence, the 2013 annual juried student exhibition at the Society of North American Goldsmiths’ (SNAG) 2013 conference in Toronto. She is also one of the student finalists in the 2014 Niche Awards competition, in both the fashion jewelry and recycled categories. Amy Masters: “Let Me Go” (installation view). Screen-printed and found: cotton, rayon, silk, satin, 2013. Photo courtesy of the Sabatini Art Gallery. Arizona-based fiber artist Amy Masters displays a vibrant but haunting piece, Let Me Go. At its very top, it begins as a sturdy and elegant cascade of patterned squares comprised of these “pom-pom-esque” circular shapes. The pom-poms or rosettes start out as a deeper blue color, but as the eye moves downward, purple rosettes are introduced to the once-steady blues. 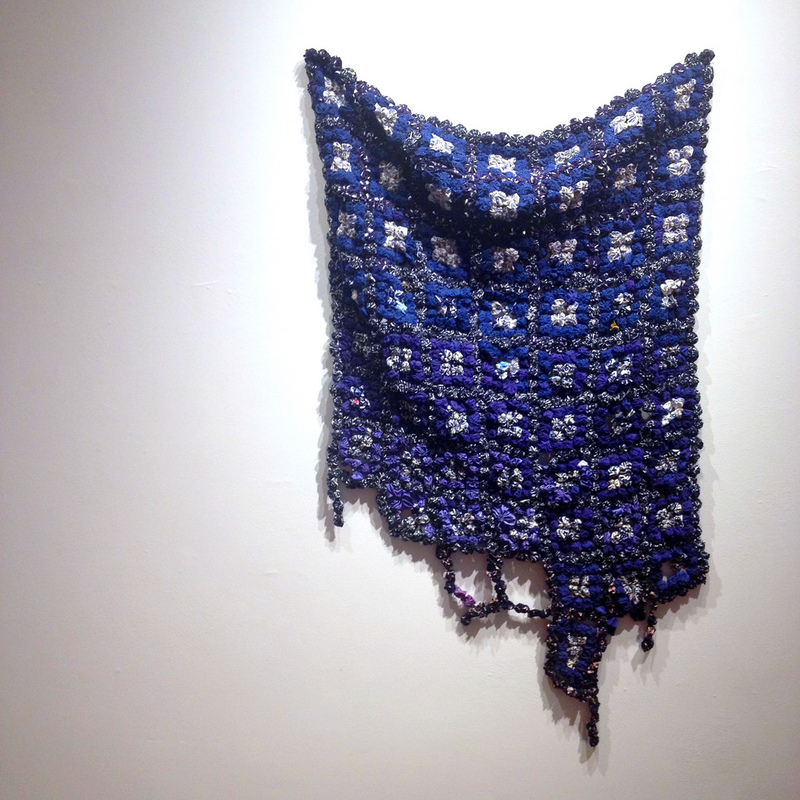 Eventually, the piece loses its look of stability by deliberately morphing into a decomposing or fallen-apart tapestry. If one was to draw a possible conclusion about this piece’s apparent meaning – one could surmise that a relationship or interaction between people once stable is now transforming gradually to a falling-apart or state of dissension, as witnessed by the grey-black threads that have turned into gaps or holes, where their upper-portioned companion squares are solid, beautiful forms. One can’t help but also wonder if Masters is employing a modern-day reference to an afghan of “granny squares” – the popular repetitive pattern of Americana’s traditional quilts and handmade crochet afghans. It is quite masterful how this fiber piece comes to a dramatic end with its sole black thread, twisted and dangling from the last fiber square at the bottom that has become distorted and elongated. Topeka Competition 31 National Juried 3-D Exhibition is open December 6th, 2013 through January 19th, 2014 at the Alice C. Sabatini Art Gallery, located adjacent to the Topeka & Shawnee County Public Library at 1515 SW 10th Avenue in downtown Topeka, Kansas. Hello! Thank you SO MUCH for the wonderful article about the Topeka Competition 31. I took the pictures of the exhibit and it was really great seeing them in your blog. Can’t wait to forward this on to all gallery staff. Heather, I’m so happy you stopped in to visit! All the curators of this exhibit – yourself, Zan and Sherry did an outstanding job – not only w/ the display and presentation of the artwork, but also in the wonderful social media coverage and installation photography. I am very glad to have been one of the artists to exhibit in such a prestigious event. Thanks so much! You’re so nice, Patricia! I scheduled a Facebook post sharing your article with our 1,576 fans. The lead-in is, “SIZE DOES MATTER!” Look for it on Thursday, January 16, 2014 at 9:00P CST at http://www.facebook.com/SabatiniArtGallery. Thank you for your kind words. I’ll be passing them along to Sherry, Zan, Betsy, Brea, and Rob. That’s wonderful news – thanks so much, Heather. Will definitely check it out! Patricia, I enjoyed reading about this very much. I especially like “Flor de Muerto”, and “Enchained” is also very thought provoking. Thank you for posting this, and your take on the exhibit is always so interesting to read. I’m so happy for you and wish you all the best with your lockets. Some day I hope I can visit one of your shows! Likewise, Anita – I wish that someday soon I will be able to attend one of your events in Chicago to view your incredible paintings in-person! I really appreciate your feedback – and I’m glad that you like those two jewelry pieces I chose to discuss. I admit I had a very difficult time deciding what to discuss here – since there are over 40 artists, all w/ great work in this exhibit. Thanks again so much for visiting and commenting, Anita! Another excellent post, Patricia. And what an honor that you’re part of this show; your success is well-deserved. Nice synopsis of Westergard’s work and accompanying images; I especially love the inner ring detail. Gina, it IS unreal how the interpretive story lines, as you said, are so fascinating in both the Sunyoung Cheong and Amy Masters artworks. I would never have thought that the degradation of quality that begins in the bottom half of the Masters’ afghan piece is actually a torn portion that belongs to a longer afghan. Your assessments are superb! I love how you always bring so much more to my critiques and offer a new perspective on the works here. Thanks again so much for dropping by and commenting. What fabulous and quite different pieces except for the fact they are all very connected with the human condition. Mourning a loved one, chains and relationships. An eternal optimist who also does what is considered “difficult mending jobs” as a sideline, I couldn’t help but think “hmmm, that piece could be mended so perhaps the relationship could too.”. The Chains were fascinating in their softness and the model appears to be holding onto them willingly but does she realize she could just toss them off? As for the Urn and it’s intricacies, it really is lovely on so many levels. Thank you Patricia, it must have been difficult to choose and you really are a gifted writer. The pieces really come alive with the help of your pen. Sharon, I always look forward to your visits to artdoesmatter b/c you bring such new insights to the pieces discussed. I completely agree – although the length and breadth of the chain in “Enchained” could easily be tossed aside – the female in the 2-D photo chooses to stand gracefully and persevere. What an excellent viewpoint you’ve brought to this. Also, thanks for your generous compliments about my writing. I’m finding through interacting w/other “non-blogging” artists – there is a unfortunate lack of knowledge or wanting to learn about other fields of Craft (or fine art) amongst my peers. I.e. – jewelers are uninterested in reading about Ceramic or painting; and the painters do not want to engage in discussion w/ any art form outside of painting, etc. So I’m finding there’s a real “need” to get other artists to engage verbally w/ GOOD artwork in a differing field than just his/her own. I’m not finding this to be the case w/ other writing or blogging artists, though. Your visits are more welcomed than you possibly could know! Thanks so much, Sharon. Wow, looks amazing! Wish I could see the work in person. Thanks for including pics! Laura!! I agree – I wish I could have travelled to the gallery to see this show in-person, too. It was a unique challenge to write about work that was viewed through installation photographs (but the gallery did such a fabulous job installing and photographing all these pieces.) As you may know already, the “artdoesmatter” tourbus 😉 is heading out West to Arizona in the near future for an upcoming show that will have my jewelry on exhibit. I hope to include New Mexico at a some other future point and see your gorgeous ceramic work, in-person. My travel wish list is forever growing! Thanks again for dropping by and commenting! An interesting review Patricia. For me, the strongest piece of these three is the simplest. My interpretation is war-torn Afghanistan, loss of colour and destruction of culture. Splendour and wholeness…..to tatters. But the title suggests a childhood blankie! I am off the mark by thousands of miles! Now that you mention it, I do recall reading somewhere that some of Amy Masters’ recent work may be inspired by childhood icons or common household items. So, you may be onto something here. I do always love how you bring your own vision into reacting to the pieces I discuss. Thanks so much, Philippa – I always welcome your visits to my blog! Thanks Dawn. There could easily be a part 2 to this – as the clay/glass/wood media were equally impressive. (But I’ve got too much going on in the studio right now – I know you can relate, too.) Thanks so much for stopping by! Thanks again for such a lovely overview. Oh, Heather, I’m so happy to hear this. And what a lovely introduction you wrote on FB, also! I really appreciate your stopping by to let me know. I’m generating quite the buzz on “artdoesmatter”, too! This is indeed an impressive exhibition. It must have been difficult to pick just a few pieces out of so many. The pieces you chose are quite strong, and really piqued my interest. My favourite is “Flor de Muerto”. Mysterious, precious, thoughtful, and so perfectly executed. Patricia, I agree wholeheartedly with your comment to Gentlestitches: it is so vital for a craftsperson/artist to look at other art forms. Your blog is a great resource in that regard. As usual, your post was very articulate and engaging, and allowed me to expand my horizons. And congratulations, once again, on having your Widget Locket selected! Dominique – I really appreciate you mentioning and esp. agreeing re: artists needing to be able to look (and talk!) about other art forms. Young artists are not the only ones guilty of ignoring other media; the older “pros” are sometimes worse!! I’ve reached out to many folks via the blog, or via social media, only to find that if he/she is a potter, then ‘let’s only talk clay! !’ Or if metals – only want to read my blog when a jeweler is under discussion. It’s got to be the worst mindset in one’s artistic practice to not look at all art/craft media. I knew you’d appreciate this point and understand! Thank you again, Dominique, for offering such lovely and inspiring commentary!